Hunt or be hunted has always been my mentality. I don’t hide the aggressiveness of competition behind All-Star parties, sponsored events, and the idea that the weekend game is a well deserved break. The fans voted me in to watch me take on the world’s best. That competition is what I love. Whether my counterpart is ready or not, resting or not, or just feels like going through the motions, it has nothing to do with me. When I play, I compete, and if you’re too busy acting cool for the fans or celebrities courtside then I will demolish you in front of them. I want MVP. There’s no shame in feeling that way. Why should there be? I want the world to see me dominate the players that are debated by millions of fans as being on my level. Competing with this spirit is fun to me. As a fan, I can only hope one player decides to take the game on the same way I do and raise its level from the opening tip. Being passive aggressive in this competition means you’re fine with simply going with the flow and unwilling to disturb the calm waters of the game to accomplish your goals. I see that as a weakness. It’s our nature to compete. Throw the ball up and let’s see who the alpha is. Competition at it’s highest level. Every ball player and athlete should watch! If everything goes to plan, Tom Brady will soon enter a place where only a handful of other quarterbacks have gone before: his 40s. 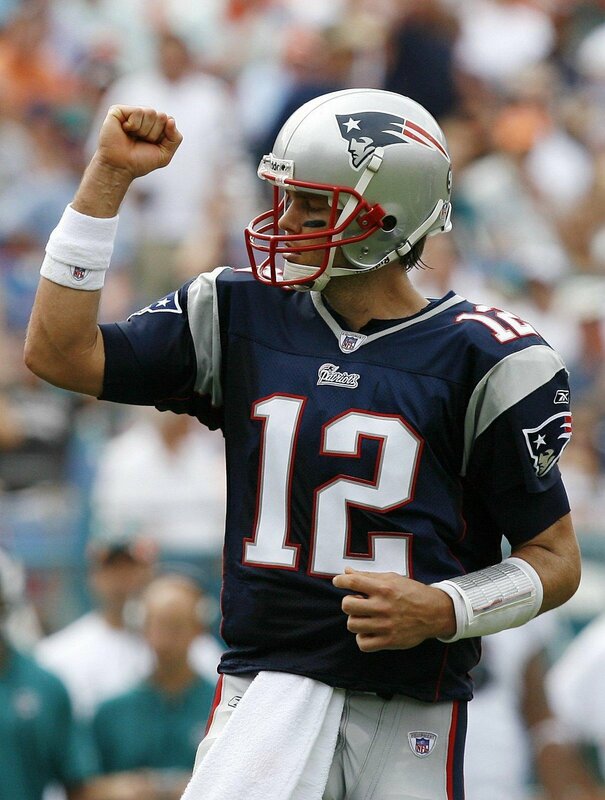 Brady will be 38 years old at the beginning of the 2015 season. He has three years left on his contract, and every indication is that he wants to play as long as humanly possible. Every time you read a profile of Brady, the main takeaway is: this guy only cares about football. His work ethic and training regimen are legendary, and those two things will be vital in preventing the one thing that can derail his dream playing into his 40s: injuries. Let’s start here: Brady is a quarterback whose daily schedule, both in and out of season, is mapped clearly into his 40s. Every day of it, micromanaged. Treatment. Workouts. Food. Recovery. Practice. Rest. And those schedules aren’t just for this week, this month, this season. They’re for three years. Brady has three years left on his contract. If he’s still playing in 2017, the final year of his current deal, he could become just the fourth NFL quarterback to ever start 10 games in a season at 40 years old or older. Even now, Brady is in rare company. Only 18 quarterbacks have started 10 games in a season at age 38 or older. Since Brett Favre retired in 2010, the only 38+ QB to start that many games is Peyton Manning in 2014. 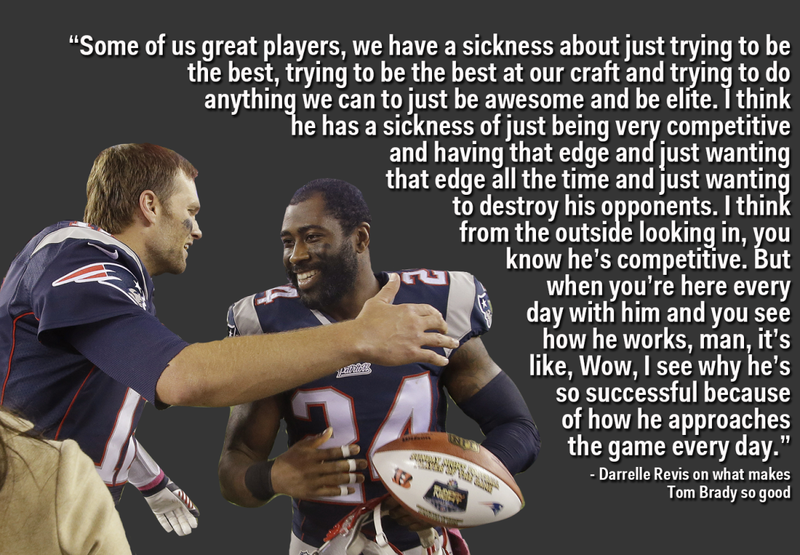 If Brady gets his way, his longevity might end up being the defining aspect of his legacy. Brady recently restructured his contract. In effect, he got $3 million more in salary in exchange for making his contract unguaranteed. The way he restructured his contract actually made it easier for the Patriots to cut him if his form starts to dip. It’s a bold move, but it’s clear that Brady is doing everything he possibly can to make sure he keeps winning Super Bowls at an age when his peers have long since retired. Seven years since arriving in Oklahoma City, the Thunder head coach is still in awe of the city’s gratitude toward him and the team. “It’s a special place to live,” he says. But he knows that feeling may be fleeting considering what his talented team is currently up against: out of the playoff race in the stacked Western Conference, a year removed from the conference finals and three from the Finals. There’s no coach facing more pressure in the West. Last week, Brooks sat down with Bleacher Report in OKC for the first extended interview in his coaching career, saying, “I very rarely want attention on myself; the players deserve the credit.” He opened up on the team’s challenges and evolution, Kevin Durant and Russell Westbrook’s relationship, his coaching secrets and much more. Bleacher Report: Regarding the season so far, Kevin told me after practice, “I’ve never been through anything like this before.” What’s it been like for you and the team? 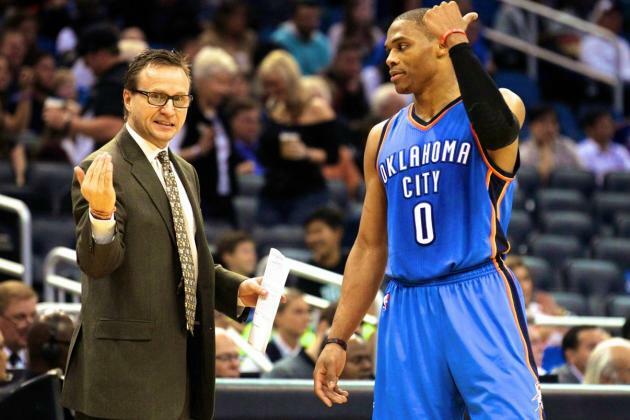 Scott Brooks: This has definitely been a challenge. There were times where we had, like, seven guys and weren’t really practicing; we were just walking through things because we didn’t have the manpower or the energy to have a practice. That threw me in scramble mode, where we used more zone defense and were trying to figure out how we can win fourth-quarter games. We missed some shots at the end of games. I learned a lot about the team; they didn’t make excuses and we still were very competitive. I also learned about myself; it’s important to delegate and have everybody feel part of the process. B/R: Players don’t question their relationship with you, which seems unique. Someone with the team told me you’re the “personal touch” the team has needed through the years, especially for Kevin and Russell. How do you keep the guys motivated? SB: I tell the players all the time, “I don’t have the answers, you don’t have the answers, but let’s figure them out together.” A lot of times they have great suggestions, and sometimes they don’t, and you’ve got to let them know. I’ve always felt that the way you establish a relationship with your team is to always have a connection with the guys. I sometimes do free-throw competitions with them, but I’m still learning what really motivates the guys. People always say, “Are you a players’ coach or not?” I say, “I’m a fair coach.” If you give great effort to the team, I will do everything in my power to make it work. Luckily for me, Kevin, Russell and our leaders are great examples for all of our players. So very rarely do I have to coach the effort and get on guys. SB: I try to challenge guys all the time that way, especially the veterans. I’ll say, “Hey, Russell, what do you think about this right there? Is this guy in the right spot?” And he’ll say, “No.” And I’ll say, “Add to that. Tell him what he needs to do.” Our guys are pretty sharp that way, like Kevin, Russell or Perk [Kendrick Perkins]; they’ll say, “Come on, man, that’s your man, quit trying to look for an out” or something like that. Film sessions have been great with really developing our team. I’ll also change player positions in practice so they can understand each other. I’ll run a skeleton offensive drill—no defense—where I’ll have, like, Perkins at point guard and Russell at the five running pick-and-rolls. Then I’ll stop and say, “Perk, you didn’t get into the ball; you didn’t force it over the screen and square him up. And Russell, you didn’t bump the screener; you didn’t come to the level of the screen and you didn’t wall off the point guard.” They’re like, “It’s not as easy as I thought.” So it helps them appreciate each other’s role. B/R: You’ve pulled off the difficult task of getting two superstars to buy into your program for a long time. What’s been your formula? SB: It has to be based off of effort and the dirty things. I always tell our guys, “The dirty job, garbage-pail mentality is not for Perk and Nick Collison; it’s for Kevin and Russell.” If they’re not defending and they’re not getting on the floor for loose balls and they’re not trying to win every free throw block out, and they’re not trying to win every jump ball, why is it important for the other guys to do it? Trust me, it’s not easy, because it is a star-driven league and everybody loves points—players, writers. But with Russell and Kevin, they’re first and third in assists, and we always challenge them to give us more of that. It’s really a unique combination and they do a great job of really complementing each other. Early on in their careers, and I still do it occasionally, I put them on different teams in practice to see who can rally their teammates to beat the other guy. And they get after it. It makes the scrimmages much more intense. B/R: What catches your eye about Kevin and Russell’s training? SB: Both of those guys work extremely hard; they don’t mess around. When we have an 11 o’clock practice, they’re on the court at 9, 10, getting their shots up for like 20 minutes with one of our coaches; Kevin with Adam Harrington, Russell with Robert Pack. Kevin loves to challenge himself, whether he wants to finish with the left-hand or right-hand hook, or the one-foot Dirk [Nowitzki] shot that he’s mastered. I’ve been around players where they try stuff in the game, and I think, I’ve never seen him work on that in practice. But everything Kevin and Russell have done in a game, I’ve seen them work on. Russell has really improved his layup game, finishing with his left and right, and his pull-up jumper has gotten better. 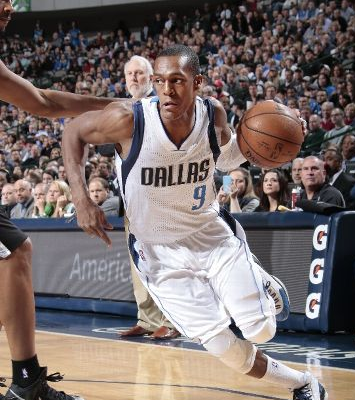 You can’t stop it in transition; if he’s got his feet set and he’s balanced, that’s a 60 percent shot for him. SB: Never. That’s so many days away. I understand it, but it’s not something I’m even focused on. All coaches focus on day to day, and we worry about what we can do today and keep chopping away. SB: There’s no question you can spin the numbers any way you want, but I look at the fact that we’ve won a lot of games and our offense has been in the top five the last few years. But I’ve challenged the guys: “Let’s change how we score,” because in 2011-12 we were 30th in assists and we’ve improved every year. Our goal this year was to get in the top 10; it hasn’t happened because it’s an asterisk season for us with injuries. We’ve always wanted to be a high-scoring team, but implement more screening and passing. And Kevin and Russell stepped up. We like to call it more of an attack-spots-on-the-floor offense. Trust me, it drives me crazy when they do dribble too many times, and we’ve worked to correct that behavior. I’ve told them, “Think of better ways to score without using the dribble as much.” We’re not where we want to be, but we’ve definitely gotten better. SB: That’s where the eye test tells you, like, come on, pass the ball, but offensive numbers can help that, too. I’m getting more into analytics—I think it’s important—but the only thing I always question is the plus-minus. Some [writers] say, “Why did you play this guy? He was a minus-15.” I’m, like, “How did I know he was going to be a minus-15 until the game was over,” or, “It’s Kevin Durant and he had a bad game. What are you going to do, not play him?” I think [five-man] units are more important than one guy. B/R: How do you think you’ve evolved as an X’s and O’s coach? SB: I like looking at after-quarter, after-timeout and end-of-game plays, because every team will have a different wrinkle. I used to never look at that part of the play. To me, League Pass is the greatest thing. I have it on my iPhone and I DVR games. I watch [a game] and then make notes myself. If I want to get the clip [to show the team], I’ll put the quarter and the time, and I’ll have our video guys clip it. You’re always watching other teams and trying to pick up things. SB: A big one is Rudy Tomjanovich. His greatest strengths were his ability to empower and connect with everybody—even [Hakeem] Olajuwon, where I’m thinking to myself, How does he make him feel any better? This guy’s the world’s greatest center. He had the ability to get Olajuwon to run through a wall for him, and that always struck a chord with me, like, “Wow, this coach is special.” Twenty-one years later, our connection is still priceless. 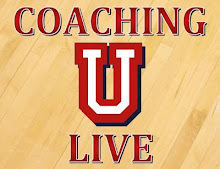 Earlier in my career, my first professional coach, Bill Musselman, taught me a very important lesson: No excuses; you’ve got to overcome the problem you have and win this game. I made $6,200 that year in 1987 [laughs]. Now, I love when Jeff Van Gundy does our games. We spend about 10 minutes together during the broadcast meeting and we bust each other’s chops. But he was one of the best coaches that I’ve ever played for. He had us playing so hard every night and he maximized everybody’s ability; the same thing with Mike Fratello. And George Karl is one of the best basketball minds. He’ll definitely get back into coaching; he’s just waiting for the right moment. SB: Ideally you’d like to have home court, but if you don’t, 1 through 8 is so good like last year. We had Memphis and we went to Game 7 and people were saying, “We had a bad series.” No. Memphis is good. They were unhealthy; look at what they’re doing now. I don’t mind being upfront and being the guy who’s criticized—I’ve been never afraid of failing—but I always laughed at all the reporting, like, “Oklahoma is struggling.” We weren’t struggling. Every game was an overtime game, and this team is still good. B/R: While you guys are currently out of the playoff race, Kevin told me confidently, “I know that people are saying, ‘The West is too tough,’ but I don’t care. Our results are going to show.” What are your thoughts? Any pressure? SB: I don’t think pressure is the right word, but definitely a sense of urgency. It’s going to be a challenge, but our guys have always stepped up for challenges, so I know this is an opportunity for them to do it again. The way we started, there could be a lot of satisfying moments at the end of the season because I know we had to overcome a lot, and we still do. There’s no question our goal is to win a championship. I know that we have the ability and we have the team to get there. By now, a one-man storm of charisma and skill has blown through four American college towns in the 21st century. In winter 2000-01, first-year head coach Urban Meyer hit Bowling Green, Ohio. In winter 2002-03, he reached Salt Lake City. In winter 2004-05, he crossed down to Gainesville, Fla. In winter 2011-12, he hit Columbus, the big one in Ohio. Last Thursday night in a dizzying Sugar Bowl against No. 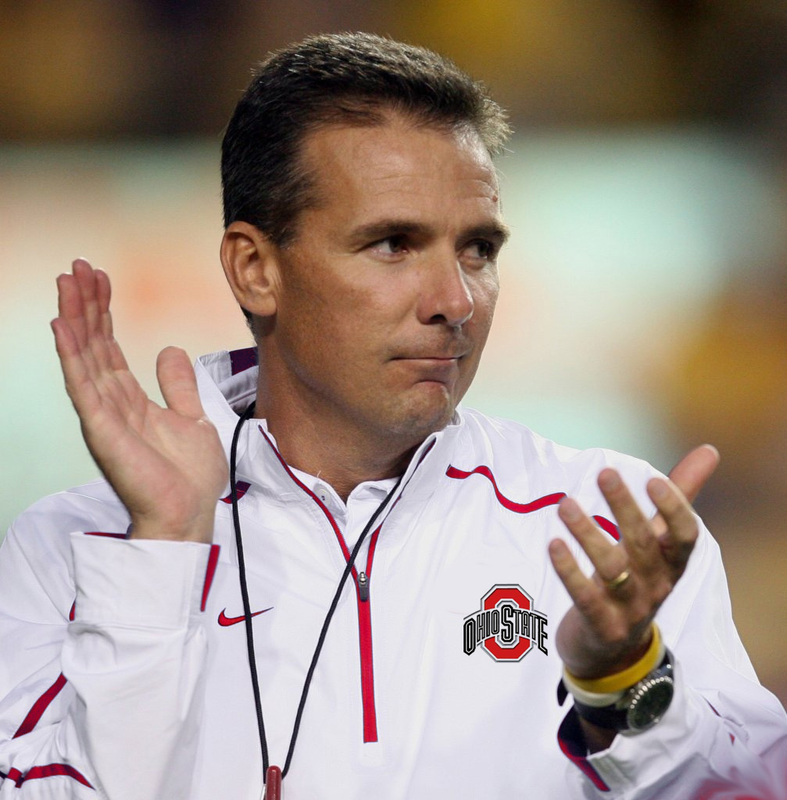 1 Alabama, it grew clear again that Meyer, 50, belongs at the tiptop of any discussion of football’s top head coaches. Ohio State’s 45-38 rally and upset not only rocketed the Buckeyes into the national championship game; it bolstered the list of the feats of the once-anonymous defensive back at Cincinnati who spent 15 seasons assistant-coaching mostly receivers. Take Ohio State’s presence in the first title game under the sport’s first four-team playoff. 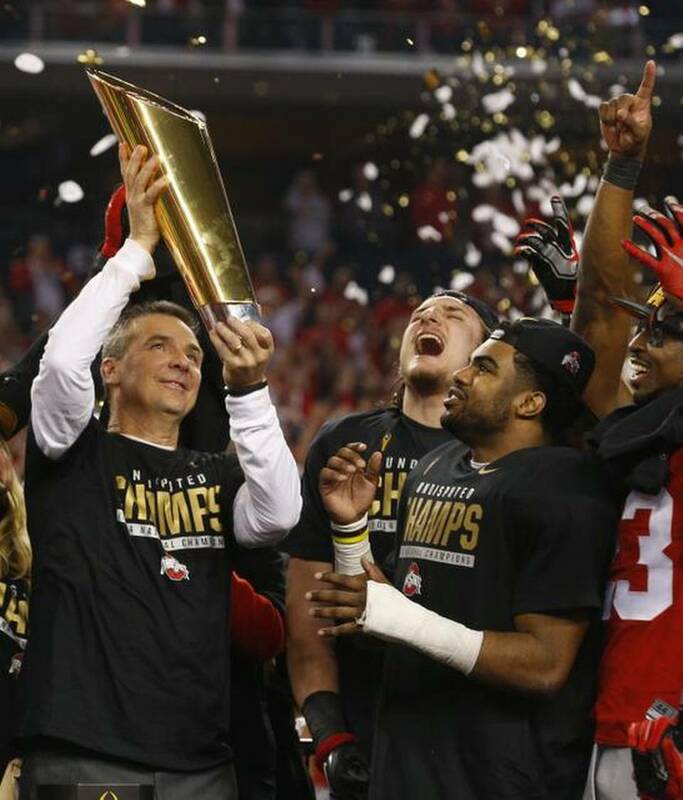 Add that Ohio State went 12-0 under bowl-less NCAA probation in 2012. Add that Florida won national championships under Meyer in 2006-07 and 2008-09, and that in 2004 — maybe even headiest of all — Meyer’s Utah became the first “non-BCS” team to qualify for a BCS bowl game, finishing 12-0 then, too. Add that Bowling Green had gone 24-42 in six consecutive losing seasons between 1994 and 1999, then went 17-5 in two seasons under Meyer. Visiting Bowling Green upset Missouri, 20-13. By a two-game swatch of September 2002, Missouri and Kansas had felt the Bowling Green wrath by 51-28 and by 39-16. Many good coaches can motivate and strategize at many levels, but through the years with Meyer, players have detected a loftier tier. They legitimately can rave about him while refraining from disparaging other coaches. When the players voted for the Utah captaincy post, Meyer announced the results at a barbecue in his backyard. Such things do seem to matter. “Things like that, that’s really cool,” Revill said. Revill recalls with horror the weekly, off-season, 5 a.m. wrestling routine designed to “weed out the least committed,” as Revill put it. Ohio State players undoubtedly had that sense of their own worth against Alabama. One after another, they told of a sense of belonging-in-the-game even as they trailed a No. 1 team by 21-6 in the second quarter and the end was nigh according to tweeting witnesses. While the country had turned its attention largely to the Southeastern Conference and to the rare excellence of Alabama Coach Nick Saban, Ohio State had its own, confidence-instilling force. Even a guy who played in only one Meyer season could see that. “I miss him,” Revill said. Excerpts from the article: Ever since he arrived in Columbus three years ago, Ohio State coach Urban Meyer has set about finding the most efficient ways to educate his players about the intricacies of his high-powered offense. What he hit upon is an approach that is increasingly popular in academic circles, but still mostly unheard of in the hidebound world of football coaching: flipping the classroom. In academia, flipped learning turns the traditional classroom-teaching model on its head, delivering lessons online outside of class and moving homework into the classroom via individual tutoring or activities. A football team might seem to be an inapplicable environment for this, but Meyer employed a similar approach after taking over the Buckeyes, who went 6-7 the previous season. In an effort to speed up the installation of his spread-option playbook—an offense that devastated defenses while Meyer was at Utah and Florida—Meyer decided to abandon old-school chalkboard sessions. Instead, he devoted team meetings to hands-on exercises, such as walking through plays and doing situational drills. The theory behind it is that introducing students to new material through short video lectures, screencasts or online slideshows outside of class time allows for the lower levels of cognitive work—gaining knowledge and comprehension—to be performed outside the classroom on their own schedule and at their own pace. Class time can then be repurposed into workshops where students can inquire about the material and interact with hands-on activities. These help accomplish the harder task of assimilating knowledge. “The whole idea is that if you can get players thinking about it and doing the mental work prior to being in the football facility, your time in the classroom will be that much more productive” Grabowski said. Now, instead of lecturing players on X’s and O’s, Ohio State coaches send them schemes and game plans via videos and interactive graphics that can be accessed on phones and iPads. Time at the facility is then devoted to walk-throughs and other interactive exercises. Kirk Barton, a graduate assistant at Ohio State, says meetings are used for situation-specific drilling. Excerpts from the article: There are few things that John Beilein doesn’t have nowadays. He has 741 wins over 39 years, climbing from a JV coaching job at Newfane to the head job at the University of Michigan. He has a basketball program that is among the nation’s elite and a contract paying him more money than anyone in Newfane could imagine. He has a wife, four kids, two grandchildren, 44 nieces and nephews and fond memories of his parents. But this isn’t about the here and now. This isn’t about Beilein having the sixth-most wins among active Division I coaches despite never working as an assistant. This is about how it all happened — how youth and maturation and happenstance led to an ordinary guy going extraordinary places. In 1975, after a few games coaching JV basketball at Newfane, John found his fire. The games, mostly meaningless, meant the world to him. Losses crushed him. Wins lifted him. The teaching invigorated him. He continued to dole out social studies lessons and began taking Master’s classes at Niagara University, but John Beilein knew he was meant to coach. 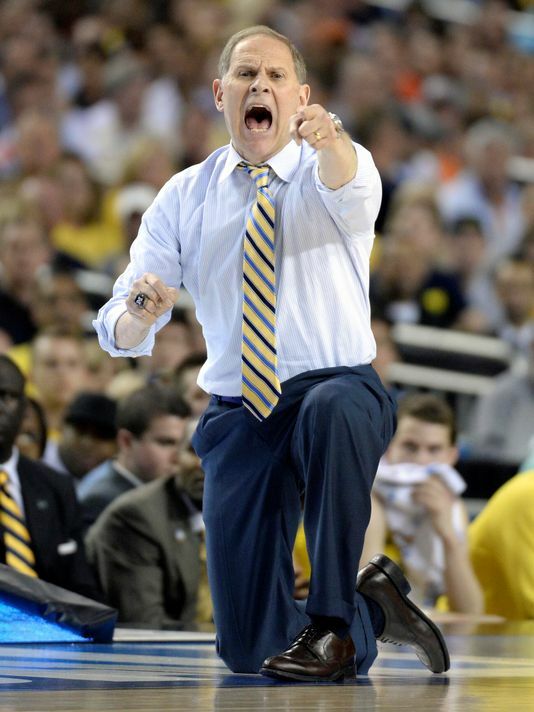 Art Beilein didn’t want John to take the job at Erie Community College. Too risky, he thought. Why would someone leave a stable teaching job to coach at some junior college in Buffalo? John ignored the logic. He had met and married a young woman, Kathleen, and had grown infatuated with not only her, but with being a big-time coach. On a date one summer night, he told Kathleen he’d coach on television against Indiana’s Bob Knight someday. Living in a small home in the Eastwood section of Syracuse, John Beilein learned the realities of the coaching life. Being a father, a husband and a college coach is like juggling an apple, an orange and an elephant. Nights on the road are spent travelling to games and chasing recruits. Nights at home are spent watching film and calling recruits. At Le Moyne, he went from being a former high school coach to a future Division I coach. His now famed two-guard offense was born from a meeting with Uncle Tommy, the AD. When Beilein complained he didn’t have good enough point guard play, the old coach in Tommy responded, “Oh, really? Well why don’t we just pack it up and fold the whole damn program.” Instead of doing that, Beilein decided to change his system. Having spent time watching various offenses based on spacing, cutting and flow, Beilein realized the power of film study. Seana would dart around the family living room as her father sat, knees pressed together a VCR on his lap, thumbs manning the PLAY and REWIND buttons. John Beilein reflects for a long second, lowering his eyebrows.